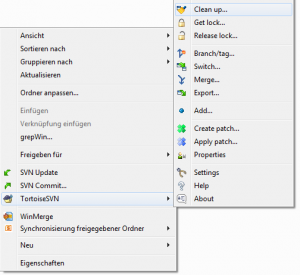 TortoiseSVN is a great Windows Application to access (and even create) SVN repositories. It integrates perfectly into Windows Explorer and has very good merge and diff tools. 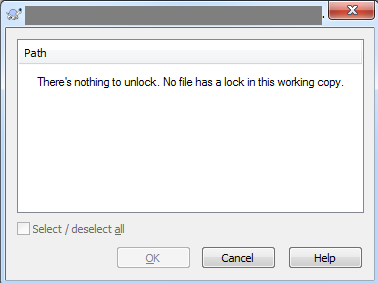 In my opinion it’s simply the best Windows SVN client available. If you don’t use it already, you should give it a try. 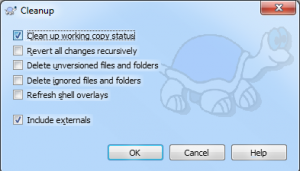 When I tried to apply a patch using TortoiseSVN, I noticed I wanted to apply another patch instead and therefore closed the merge program before it was started completely. Right-click on the directory and choose “TortoiseSVN”/”Clean Up”. Click “OK” and that’s it. You can now again update or apply patches without any problems. I hope this helps somebody to solve his problem a little faster.